Fort Lauderdale, FL – Gas prices finished out the month of April with a final price increase in nearly all regions, according to the latest fuel price survey from the U.S. Energy Information Administration. The weekly E.I.A. fuel report shows the average U.S. gas price nudged upward just over a penny per gallon, once again, to about $2.45. 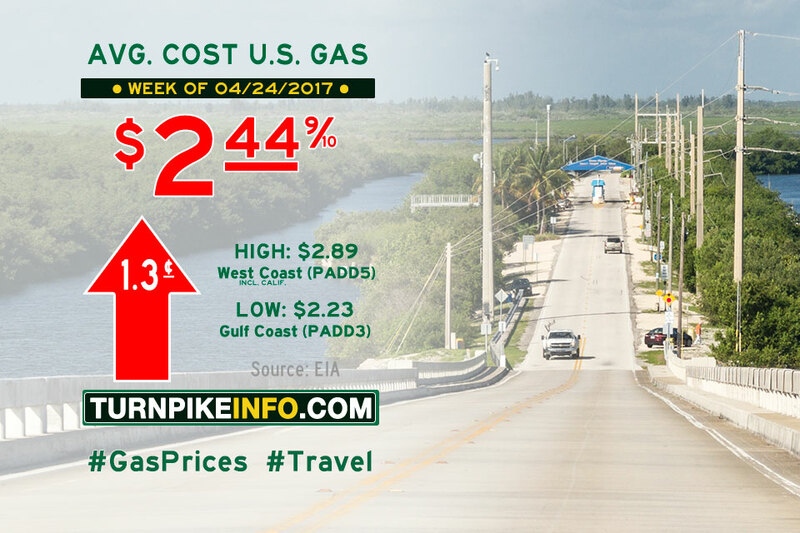 Drivers along the Gulf Coast caught a break this week, according to the survey, but that was the only region to see a price decline. The price of diesel scarcely moved for most truckers, according to the E.I.A. survey report. The cost of diesel actually held stead in most areas, while increasing slightly in the New England region. Nonetheless, the average price of diesel remained $2.60 for the final report of April. Fort Lauderdale, FL – Last week’s stunning increase in gas prices was followed by another series of strong regional price hikes, according to the latest fuel price survey from the U.S. Energy Information Administration. However, price declines across the Midwest and more pricing stability across the West Coast kept the average U.S. gas price in check this week. The average cost of a gallon of regular unleaded rose just over a penny per gallon to $2.42, according to the E.I.A. This week’s report, released a day late because of an unspecified technical issue at the E.I.A., shows that, region by region, pricing volatility was the rule this week. Prices across the Gulf and Atlantic Coasts, in the Rocky Mountains and across the New England states soared anywhere from four to five cents per gallon. Coupled with the previous two week’s price hikes, drivers in those states are paying seven to 14 cents per gallon more for gas, and that’s just since the start of April. Prices in the Midwest declined this week, but that still leaves prices 18 cents higher than were they were just three weeks ago. For truckers, the news is not quite as bad, but price increases were the rule. The E.I.A. reports the average diesel price is now a fraction under $2.60 per gallon, though regional prices, like gasoline, vary widely. Fort Lauderdale, FL – The price of gas took another stunning surge upward on the week, as the average price of gas shot higher by more than six cents per gallon, according to the latest survey from the U.S. Energy Information Administration. The nation’s average gas price has now pushed up nearly 11 cents in two weeks, to over $2.42 per gallon. 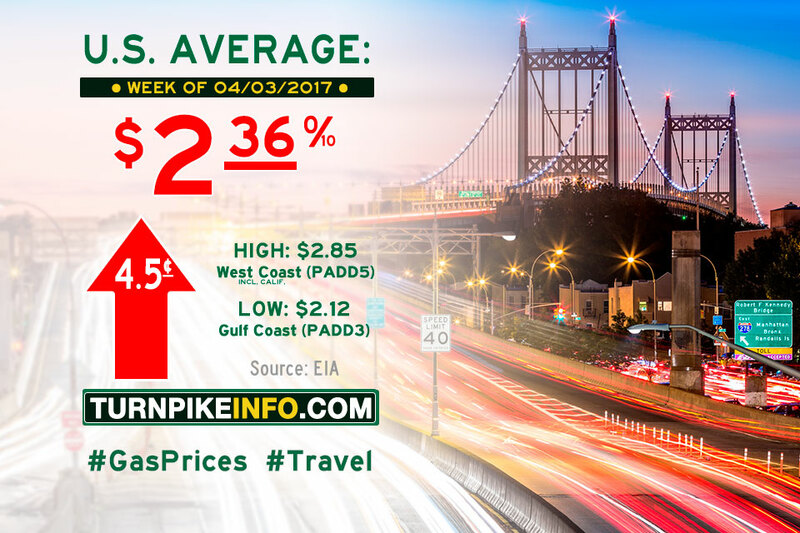 Prices increased in every region, with most drivers paying seven to eight cents more per gallon this week than last. Only drivers on the West Coast and in the Rocky Mountain states were spared such harsh increases, which, not coincidentally, helped keep the nation’s average price hike in check this week. Even so, a gallon of gas on Los Angeles still cost two cents more today than last Monday. Truckers got hit with a price hike in diesel this week, according to the E.I.A. But, diesel prices did not rise nearly as badly as regular gasoline. The average price of diesel still pushed up nearly three-cents to about $2.58 per gallon. Fort Lauderdale, FL – The price of gas took a shocking turn higher this week for most Americans, according to the U.S. Energy Information Administration. The nation’s average gas price shot nearly a nickel per gallon higher to $2.36. The steepest price gains were found in the Midwest, including a stunning 22-cent price leap in the Cleveland area, which also includes portions of the Ohio Turnpike. Prices surged along the Gulf Coast and much of the East Coast, as well. Truckers got hit with a price increase in diesel this week, according to the E.I.A. While diesel prices did not rise as much as the cost of gasoline, the average price of diesel still pushed up over two-cents to about $2.56 per gallon.